How do you backup a book? So I’m a big fan of paper books because they’re just so easy to borrow and lend, but I’ve hit a bit of a problem: persistence. I noticed the other day that the wall was damp next to the bookcase, and have spent the best part of a day ripping the books out, brushing the mould spores off an categorising them into “fine”, “not so fine” and “possibly irrecoverable”. 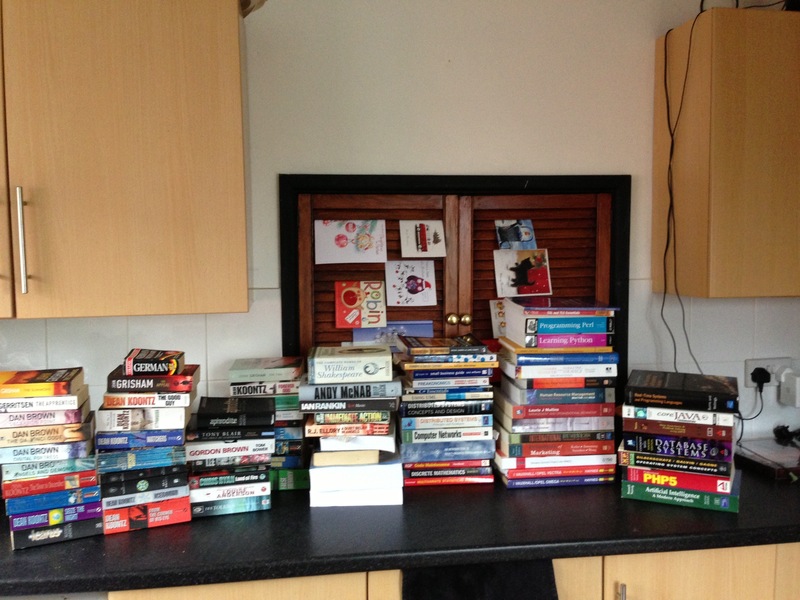 The photo above constitues all the books falling into the latter two categories. The majority are academic textbooks from my university days, which is great because I don’t really need them anymore, but less great because they’re also the most expensive if I did want to replace them. It’s so frustrating to see a mixture of your prized childhood books and the trashy action novel you read on holiday all suffering from the same problem. Paper is fragile, and right now I wish I had all those pages stored safely in a (DRM-free) electronic format somewhere. That said, would an electronic book hold the same sentimental value as the hardback copy of Swallows and Amazons you read by torchlight when you were supposed to be sleeping?